U2 are a very hard-working band, having played some 217 shows in 11 countries in the last 12 months. They're always on the lookout for the old Vox AC30's with the original Rola G12 'Blue' loudspeakers still intact. The Edge plays a superb black Fender Strat, which, unusually these days, is complete with tremolo arm, as his main instrument, but also has a Gibson Explorer which is used on certain numbers and also serves as a spare. Both these are tuned a semitone down to E flat so as to suit the natural pitch of Bono's singing. The guitar is fed via a change-over switchbox to two Memory Man echo units, the output of each being fed into a separate Vox AC30 combo. The two echo units and the two Vox are set up to give different sounds, and by simply stamping on the switch, he can select either or both as required. The AC30's are stood down on the floor, tilted forward, and with a piece of carpet laid on the floor in front of the amps so as to minimise the throw of sound onto the stage. Each Vox is separately miked, one with a Shure SM58 the other with an AKG D1200 - the latter being due to availability rather than to any specific performance considerations. 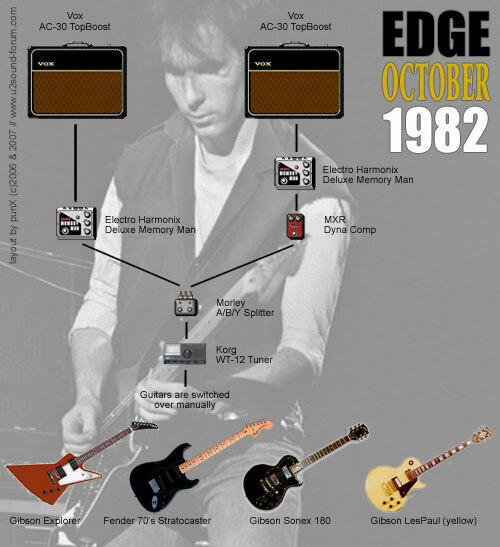 The Edge also use Shure SM58 vocal mikes and a Yamaha CP70 electric grand piano on stage.